Horses graze natural and feed-related causes of colic are rarely suffered in pastured horses. However, with today’s specialized athletes that is often not the case since they are placed in stalls and consume large amounts of grains and other concentrated feeds. Both owners and managers need to work hard to provide today’s horse with a balanced nutritional need that helps the natural function of the equine gastrointestinal tract. ideally should be a wide, shallow tub, or by mixing some chopped forage in with the feed. Limit grain to no more than one-half percent of their body weight during each feeding because of the horses small stomach which means a maximum of five pounds for a horse that is a thousand pounds. Divide the ration into three equal feedings if you must give your horse more than one percent of their body weight in grain each day which is more than ten pounds per day for a horse that is a thousand pounds. You should either know the weight of your feed or at least the weight of the feed in the container you are using. Depending on the bulk density a two-quart feed scoop can typically hold under two pounds or almost four pounds of a grain or concentrate feed. A major cause of colic is the overfeeding of grain so knowing the exact amount you are giving helps feed the product at a proper rate. Adequate hay or pasture should be provided. Daily you should feed a minimum of one percent of the horse’s current body weight which means about ten pounds for a thousand pound horse. To provide sufficient forage you will need at least two acres per horse based on seasonal availability. Horses should never be allowed to eat moldy feed or hay. Horses are especially susceptible to a condition known as equine leukoencephalomalacia or ELEM which is also known as moldy corn disease. High levels of aflatoxins are found in moldy hay. Symptoms ranging from digestive upset to severe liver and brain damage which are fatal can be caused by these fungal toxins. 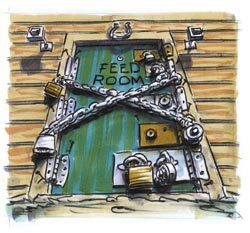 Feeds should always be kept in areas inaccessible to horses. You should also take extra caution to prevent horses from consuming feeds labeled for ruminants only if you have cattle on the same property. Additive such as monensin, lasolocid or urea are found in these feeds and are poisonous to horses. To allow the horses’ large intestine to adapt you to the microbial population you should change rations slowly. The feeding rate should never be increased by over a pound each day. Gradually replace the old feed with the new feed when changing over a seven to ten day period such as twenty-five percent, then fifty percent and then seventy-five percent. When you have a different cutting or a new type of hay you should use similar methods especially if you are changing between legume hay such as alfalfa, clover, and grass hay such as timothy, orchard grass, Bermuda grass, etc. Allow horses to graze only for a few hours when you first start them on pasture and give them some hay before turning them out to the pasture. More energy than good-quality forage is required for growing, breeding and performance horses. Consider adding a supplement fat to the horse’s diet or using a fat-added feed with a greater than three percent fat if you have a horse that requires a larger amount of calories and has to be given ten pounds of more of grain each day. Adding fat or using a fat-added feed allows you to feed less grain and more forage since fat is a more concentrated source of calories. One and a half to two pounds of grain in a daily ration can be replaced by one pound of stabilized rice bran. Both the major and trace minerals should be provided in adequate amounts. The regulation of body water balance and thirst response to dehydration depends on adequate mineral consumption and this will help lessen the risk of impaction colic. A certified equine dentist should check your horse’s teeth at least one a year and the teeth should be floated if necessary. You horse can be prevented from adequate chewing if they have dental problems. By properly maintain your horses teeth you will decrease their chance of impaction colic. Use the guidelines provided by the National Research Council, a scientific group that is sponsored by the U.S. government to provide proper feeding guidelines for horses and other animals, to find a balanced ration for your horses. Check with an equine specialist or nutritionist if you are in doubt or don’t know what or how to feed your horse. Horses need an environment that is as close to natural as possible with either daily turnout or grazing. Horses that have regular exercise or activity have a lower chance of colic than horses that are continuously stalled according to research studies. Read the next horse nutrition article on Colic prevention.